RoseHosting Review 2017 | Performance Over Features? On the whole, RoseHosting isn't a terrible choice if you are looking for a place to host your Magento site. In fact, they offer a lot of benefits to customers – from a good variety of hosting plans, to easy Magento installation and migration, to solid uptime, and even weekly backups. Unfortunately, for all the great things that they offer, there are several factors that hold their service back. For starters, their prices are a bit on the expensive side, which may turn away those on a budget. Features, meanwhile, are pretty barebones compared to the competition, while their servers are mainly US-based – which can potentially alienate a lot of customers. Still, if performance is what you are after, then RoseHosting could be worth a look. Lots of Choices: RoseHosting’s fully managed Magento hosting service offers a total of 8 VPS options to choose from, all powered by SSD storage. Easy Installation: You get Magento installation or website migration at no extra cost. Uptime: RoseHosting’s uptime is quite excellent, as it manages to go beyond the industry average of 99.90%. Weekly Backup: For added peace of mind, RoseHosting provides full weekly backups (as well as daily backups) of your website, free of charge. Limited Storage and Bandwidth: RoseHosting does not provide unmetered storage and bandwidth for most of their VPS plans. Lackluster Features: For the most part, RoseHosting’s features are pretty barebones compared to other hosting providers. US-based Servers Only: RoseHosting’s servers are all US-based, so if you need your Magento store to be hosted in another location, then you might want to look elsewhere. Price: Because their Magento hosting services use VPS by default, most of the prices are somewhat on the expensive side of the spectrum. Unlike some web hosts, RoseHosting provides a fully managed Magento hosting solution. First and foremost, this means that the company will completely support all software that is installed in your server, which includes your control panel of choice – and, of course, Magento. Being under a fully managed server also means that RoseHosting will: monitor and maintain all hardware, manage firewalls, provision IP addresses, provide free migration services and Magento installation, and more. Beyond their fully managed support, RoseHosting also offers enterprise grade SSD storage across the board, free weekly (and daily) backups, and a 100% uptime guarantee. While all of that is fantastic, the features that RoseHosting provides are pretty barebones compared to a lot of their competition. For instance, they don’t provide perks like toll-free numbers and free domains for life. So if you want more in the way of features, then RoseHosting may come up a little short. The good thing is their performance is, for the most part, pretty solid. Most hosting providers claim a 100% uptime guarantee, but the truth is no one can truly provide perfect uptime. RoseHosting comes pretty close though, with their highest recorded uptime hovering around the 99.99% mark. Their page load speeds, meanwhile, are quite excellent as well. The fastest they achieved so far is 300ms, which is definitely above and beyond what a good chunk of their competition can muster. All in all, RoseHosting provides rock-solid performance – which is definitely good news for Magento store owners. RoseHosting’s Magento hosting solution uses their VPS service by default, so don’t expect the prices to be dirt cheap. The lowest price that they offer, for instance, goes for $19.95 per month, which is equivalent to the price of a premium shared hosting plan. The highest price, meanwhile, will set you back a whopping $319.95 per month. Price-wise, RoseHosting might not be the best option for individuals, startups or small businesses on a budget. 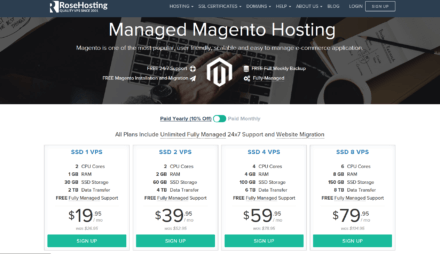 They do offer shared hosting plans that start at $4.95 per month, but the tradeoff is you won’t get the benefits of a fully managed Magento hosting plan. If you choose RoseHosting, the only smart move is to go with their fully managed VPS service. RoseHosting’s customer support is quite strong, offering round-the-clock assistance. This means they are available 24/7/365, so if you are in a different time zone, you can contact them at your leisure. They have live chat, email and a ticketing system in place, and their representatives are quite knowledgeable and respond quicker than others. Meanwhile, they also provide a pretty comprehensive knowledgebase if you prefer to troubleshoot on your own. It must be noted, however, that searching for the term, “Magento,” doesn’t yield any results, so it looks like they don’t provide any Magento-specific help articles. Not a big deal, considering the wealth of information their knowledgebase provides, but still something to take note of going in. What's the Verdict on RoseHosting? RoseHosting may not be the best Magento hosting provider out there, but they do provide enough benefits that make one stop and consider them. Installing or migrating a Magento website is a breeze, as they assist customers every step of the way, for starters. You also get 8 hosting plans to choose from, allowing for greater flexibility than most. In addition, performance is excellent, thanks to a consistently solid uptime. Unfortunately, the barebones feature-set, the lack of unmetered storage and bandwidth on lower plans, and the expensive pricing don’t do them any favors. In short, there are other choices out there that offer what RoseHosting cannot – and more.